Ben sets a (non-cryptic) crossword, reads out the clues and Lewis attempts to solve it. I solved it before Lewis, but only because I was following along and got the last two before him. This was a fun episode, thanks for putting it up. I used chenjesu's method to solve it before Lewis, although I am also proud of myself for getting 24ac significantly before him. I did not solve it before Lewis, but only because I didn't get to hear the podcast until Ben finished editing it. "Non-cryptic"? Boo. I have made cryptic versions of some clues to get revenge. 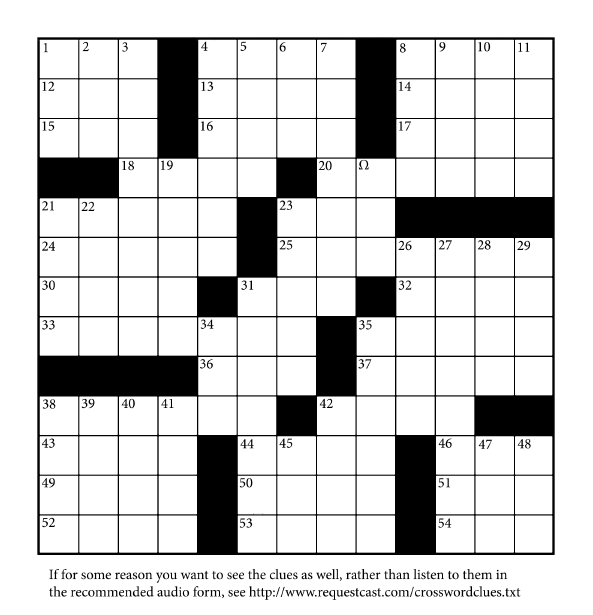 Each clue has a definition part and a wordplay part. Example: "35D. They are nice flowers, plus, it is out of order (6)"
The answer to this clue is, spoiler alert, TULIPS. "They are nice flowers" is the definition part. The other half of the clue, "plus, it is out of order," is an indicator that the word is literally "plus it" out of order. In other words, an anagram. Cryptics look crazy hard at first. But actually, they're easier in a weird way. A normal crossword might just give you "flowers" for that clue. Cryptics give you a way to double-check your answer. In addition to anagrams, cryptics can have homophones, words containing other words, charade-like piecing together of letters, and whatever else halfway makes sense. Cryptic crosswords are so much fun. They're easier in a way, but a lot of times the grid is way harder. I would say on the balance they're harder to complete, there's usually one or two clues I can't get. I might make some cryptic crosswords here later, for fun. For this to be a valid Cryptic Crossword clue, it has to have some sort of anagram in it. Try rearranging the letters in the answer to form a different word.